Our bach is located in a quiet cul-de-sac close to Whangpoua beach. It is fully fenced so very toddler-and animal friendly. It is a small designer bach with 2 bedrooms. It has polished concrete floors and open-plan living, with a large partially undercover outdoor deck area providing great outdoor living. It has a large flat fully-fenced back yard, perfect for children and dogs. Pets are very welcome. 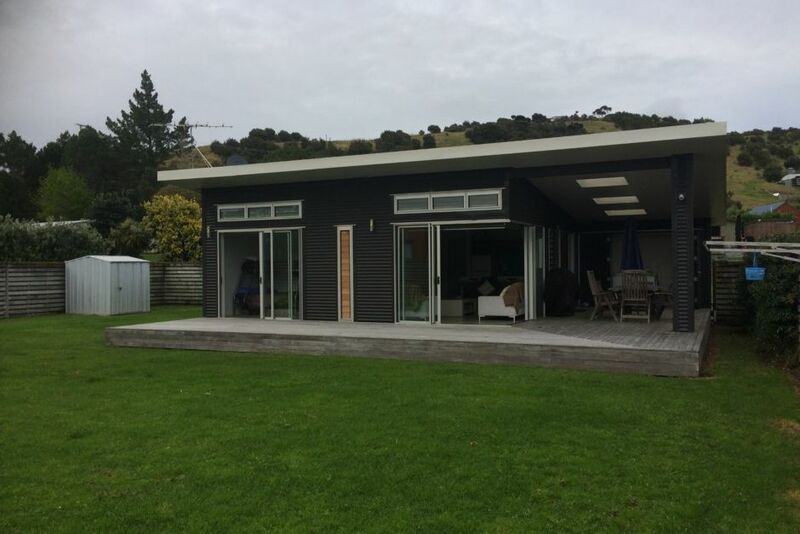 It is approximately a 2 minute walk to the wonderful Whangapoua beach, and close to the Whangapoua boat ramp and tennis courts. Whangapoua is the gateway to the beautiful and renowned New Chums Beach. It is a 15 minute drive from Matarangi town and golf course and 20 minute drive to Coromandel town. We absolutely loved our stay at Nahla's Retreat. The bach had everything we needed and was only a stones through from the glorious Whangapoua beach. We really enjoyed our 5 days in the super comfortable Nahla’s Retreat. Has everything need for those bright sunny days with great outdoor spaces and even when it rains the Sky TV and overall environment still meant a really pleasurable stay. What a wonderful spot, fantastic beach with lots to explore! A lovely modern bach equipped with everything you need, the location is handy to beach and a short walk to shop, easy clean interior (love the concrete floors) with great indoor outdoor flow, generous bathroom and brilliant shower pressure. Big bonus for us is the bach is securely fenced and our dogs loved the generous lawn area to play on. Thank you Karen and Ray for letting us share Nahla's Retreat we would certainly like to return in the near future. A nice little bach in a good location. Great yard for kids, great outdoor shower and all the basic amenities needed for a beach stay. Unfortunately we couldn’t use the outdoor seating & BBQ area because it was covered in bird poo! Suggest this is checked and cleaned prior to guests arriving. It’s also the only dining area, no dining table inside so super important it is clean enough to eat at. We had to juggle plates on our laps to eat. The bedrooms are directly off the living area with only sliding doors between which means you can hear everything happening in the living area & bedrooms. Suggest this house is not suitable for a family with snorers or people who like to go to bed early.